When her son came out of the closet, Baltimore resident Mindy Dickler felt as though she had been put into the closet. The group recently held its sixth annual parent retreat at the Pearlstone Conference and Retreat Center in Reisterstown. About 80 parents from all over the country and one from Israel attended. 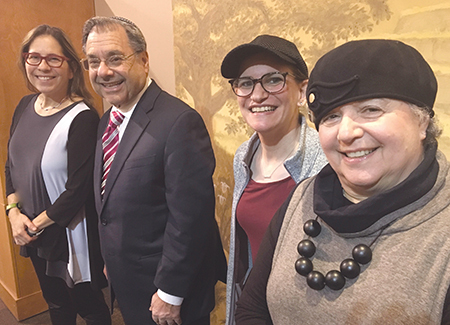 Before meeting anyone in person at such an event, Dickler joined Eshel’s monthly phone-in support meeting for parents when it was a pilot program. It was, she recalls, a bonding experience. Eshel held its first parent retreat six years ago in Waynesboro, Pennsylvania. They tend to be emotional experiences. “You have a shared weekend together with tears and joy and this feeling of family,” Dickler said. Peninah Gershman, a Baltimore native who now lives in Silver Spring, started attending the retreat five years ago and has been chair-ing it for the past three years. She, too, has made friends through Eshel who have become family. When her 14-year-old son came out, it was very lonely, she said. The retreat features breakout sessions and panel discussions. A lot of it is just talking and developing relationships. “We have Shabbat meals together, which are wonderful,” Gershman said. This year, Eshel invited Efrat’s Chief Rabbi Shlomo Riskin to be the retreat’s scholar in residence. Miryam Kabakov, the executive director of Eshel, says she was very moved by Riskin’s talk the first night of the retreat. Kabakov, who came out to her parents when she was in her 20s, says it was a terrible time for them, in part because they were com-pletely isolated. “My parents needed this. They didn’t have it, so I helped create it,” she said. Today, Kabakov’s surviving parent, her father Bernard Kabakov, attends the retreat. Dickler’s son lives and works in Washington, D.C. now. “We accept him as he is, and we continue to be a warm, loving family. Everything’s cool,” she said. The toughest challenge for the family is that he chose not to be observant anymore. After the retreat, the work continues. Dickler is co-founder of JPride Baltimore, a Jewish LGBTQ support group, which cosponsors Orthodox support groups as well. “It’s a safe space in Baltimore where, for at least one night a month, they can be free and honest about who they are,” Dickler said. Eshel is also taking its message to schools, encouraging students and alumni of yeshivas to record a video of themselves urging their schools to adopt a policy of inclusion. Eshel plans to present the videos to yeshivas. Dr. Sunni Epstein is director of the Welcoming Shuls Project, a grant-supported multiyear exploration of which North American syn-agogues welcome LGBTQ Jews and to what degree. Epstein says she’s a “matchmaker” for LGBTQ families trying to find accepting reli-gious communities. “Orthodox rabbis are finding ways to embrace LGBT Jews,” Greenberg said. But gay couples joining synagogues pose political and re-ligious challenges for the rabbis, he said. Epstein wants her daughters to remain observant. Erica Rimlinger is a local freelance reporter.